Carter (Thomas Jane), a troubled veteran gets a chance at redemption by protecting a 12 year-old girl from a deadly assassin (Laurence Fishburne) after she witnesses a murder. Holding a shotgun with a single shell, he engages in physical and psychological warfare in a desperate fight for the girl's life. After accidently witnessing a murder in a graveyard, a young girl, Bird (Ella Ballentine), becomes the killer's next target. When the assassin, Sade (Lawrence Fishburne), chases after her, Bird takes refuge in a nearby house where she soon comes under the protection of its sole resident, Carter (Thomas Jane). As Carter and Sade engage in a battle of (mostly verbal) intimidation, our hero attempts to keep the little girl alive -- no matter the cost. Primarily relegated to a single location, the majority of the runtime takes place in Carter's house, with our protagonists taking refuge upstairs, and our antagonist setting up shop downstairs. Both men are armed, but poor Carter isn't exactly swimming in ammo -- resulting in, yes you guessed it, a standoff. At its core, this is actually a pretty solid low-budget thriller scenario -- albeit one we've already seen countless times before. And unfortunately, the filmmakers do very little to help set this version apart. Taking clear inspiration from the works of Quentin Tarantino, the script actually ends up being surprisingly dialogue heavy, and the writer tries to layer Carter and Sade's sparring with some genuine personality. Though this attempt at verbal flair is admirable, the results mostly fall flat, making Sade's flashy dialogue sound like a tossed aside first draft from one of Tarantino's early scripts. A lot of dramatic whispering, shouting, and name-calling ensues, but little of it is particularly engaging. Likewise, a few heart-to-heart philosophical musings on the nature of men and monsters never hit as hard as intended, and some obvious visual symbols (a red balloon for instance) are a tad groan-inducing. It also doesn't help that the film's stars don't seem to be terribly engaged in the clichéd material. 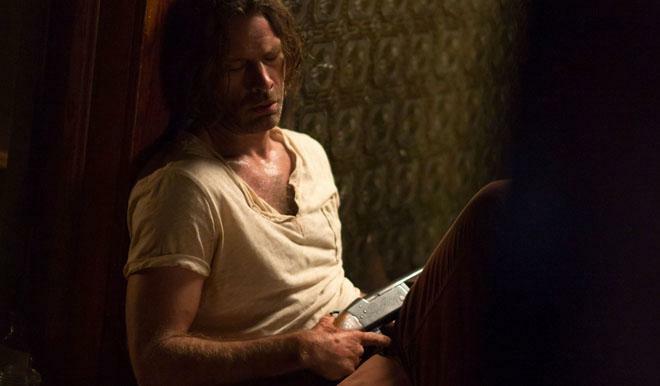 Thomas Jane offers an appropriately brooding performance, but the man just seems tired and disconnected for much of the film -- and not in a character-driven way. In fact, there is a general lack of immediacy during certain stretches, making it seem as if Carter and Bird should be a tad more worried. Instead, they just come across as kind of sleepy. Laurence Fishburne on the other hand, seems to be having more fun turning in his best Sam Jackson impersonation, but the role ultimately feels like an imitation of far more interesting assassin characters from other movies. Thankfully, there's actually a bit more to the film than just lazy characterizations and annoying dialogue. While early action involves a comically abrupt assassination and some 'Home Alone' broken glass antics, there are some legitimately tense moments peppered throughout, and the climax is genuinely well staged. At its best, the film evokes an old-school 80s thriller vibe, and there are a few visual flourishes that prove to be quite striking. Gliding camera movements and POV shots help to add some flavor to the proceedings, and key lighting choices create a palpably eerie mood in the third act. One particular shot featuring Sade's face cast in a dark orange highlight barely visible in profile, is especially powerful. Similar bold lighting permeates the finale, elevating key moments beyond the film's default mediocrity. Even if one ignores the false advertising of its cover (I want that damn explosion! 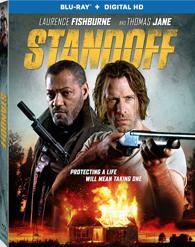 ), 'Standoff' ends up being a pretty subpar thriller. There's some attempts to liven things up with "flavorful" dialogue, but the trite characterizations are forgettable. With that said, the movie does work surprisingly well when the characters stop talking and the director emphasizes mood and visuals. While I'm usually a staunch proponent of people working out problems using their words -- in this case I just wish the characters had kept their mouths shut. Lionsgate brings 'Standoff' to Blu-ray on a single BD-25 disc that comes housed in a keepcase with a cardboard slipcover and instructions for an UltraViolet digital copy. After some skippable trailers, the disc transitions to a traditional menu screen. The packaging indicates the release is region A coded. The movie is provided with a 1080p/AVC MPEG-4 transfer in the 2.39:1 aspect ratio. Marked by some surprisingly engaging cinematography, the video looks quite solid throughout with only a few sporadic technical quirks. The digital source is mostly clean, but there are occasional signs of minor compression and banding, including some false contouring that crops up around light sources. Thankfully, clarity is strong with sharp fine details and textures, revealing every pore and crease on the film's two rugged leads. Depth is also impressive in a few early outdoor scenes, but some of the indoor material is a bit flatter. Colors start off on the cool side though key wardrobe choices, like a red dress, pop intensely from the screen. Likewise, a few overtly moody lighting schemes make great use of bold colors, including the climax which is often bathed in a red glow. There are some artifacts here and there, but the transfer is proficient overall, making the most of the film's modest budget and single location. The film is presented with an English DTS-HD MA 5.1 track with optional English, English SDH, and Spanish subtitles. Though fairly enveloping, the mix can sound a tad forced and awkward at times. The alternately whispery and screaming dialogue is clean and well prioritized throughout (even if some viewers might wish that it wasn't). Likewise, the track's sense of general ambiance is solid, with appropriate effects (rustling wind, dogs barking, crickets) spread around the soundstage during outdoor scenes. Gunshots carry a decent kick, and LFE activity is deep when called for. With that said, there are elements of the mix that lack finesse, leading to a slightly unnatural quality. For instance, one scene features Sade throwing various objects off-screen, sending crashing and thudding sounds to the rears, but the transition from the front speakers to the surrounds is noticeably abrupt and a little too forceful, lacking the smooth imaging found on other tracks. A later scene where one character walks across glass also sounds a bit off, with the breaking glass noise sounding rather disconnected and oddly balanced. Thankfully, the movie's tense and melancholy score features strong range, separation, and fidelity. Certain design choices are a little rough, but for the most part, the track gets the job done with a few immersive flourishes. A Fight to the Death: The Making of Standoff (HD, 7 min) – Presented in 1080p with DD 2.0 sound, this is a short featurette with cast and crew interviews. The participants discuss the film's noir western influences, gritty indie style, single location, plot, characters, and shooting challenges. Though very brief and a bit fluffy, this is a decent inclusion. 'Standoff' is a mediocre yet occasionally engaging low budget thriller. The characterizations and plot are clichéd, but there are some worthwhile stylistic flourishes here and there. On the technical front, the video transfer and audio mix are both pretty solid. As far supplements go, however, we only get one short featurette. Though forgettable, this is a perfectly watchable release that might entertain fans of similar efforts. Give it a rent.